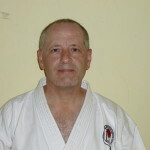 Sensei Ian Garside 5th Dan KUBG has been training for over 38 years and teaching karate for 36 years. He setup the Rossendale Shototkan Karate club in 1984. He joined the Rochdale Shotokan Karate Clubin 1974 at the age of 20, influenced like many others at that time by watching Bruce Lee movies and the Kung Fu television series. During his time at Rochdale he became Club Kumite Champion, winning the Ken Spencer Trophy for Senior Men’s Kumite three times. Ian started teaching beginners as a brown belt in 1976 and in 1977 was asked by members from Whitworth if he would teach one night a week in their area. He agreed and this quickly grew into a club in its own right, Whitworth Shotokan Karate Club, which in 1979 was affiliated to the Karate Union of Great Britain (KUGB). In 1980 he passed his 1st Dan and in 1983 his 2nd Dan JKA (Japanese Karate Association), graded both times bythe Shotokan Tiger, Sensei Keinosuke Enoeda, 8th Dan JKA . In 1984 he was voted ‘Whitworth Senior Sports Personality’. Also in 1984,and with the assistance of two senior members, he founded Rossendale Shotokan Karate club (RSKC). In 1988 Sensei Garside passed his 3rd Dan JKA, again with Keinosuke Enoeda, 8th Dan JKA. Also In 1988 he was diagnosed with chronic arthritis of both hips. In 1999 and 2000 consecutively he had both hips replaced, and within six weeks of both operations was back teaching in the Dojo. Together with two black belts from RSKC, Jeff Jones and Mike Hurst, Ian posed entirely naked except for his black belt for the ‘Rossendale Uncovered’ 2006 calendar to help raise much needed funds for Rossendale Hospice. In 2009 he received the‘Lifetime Achievement Award’from Rossendale Leisure Trust and was nominated for the Lancashire Lifetime Achievement Award for his dedication to and promotion of Karate in Rossendale. 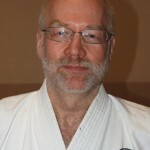 In 2011 he passed his 5th Dan KUGB with Sensei Andy Sherry, 8th Dan,Chief instructor of the KUGB. In 2012 he was given the honour of being an ‘Olympic Torch Bearer’ for his service to sport (Karate) and his work for the local community. For more than 18 years Sensei Garside has championed relations with Tub Bocholt Karate Club in Germany, Bocholt being twinned with Rossendale. He has been invited on numerous occasions to teach and give karate seminars at Tub Bocholt, focusing on kata bunkai. RSKC has also hosted many visits from Tub Bocholt over the years, including to RSKC’s 10th, 20th and 25th anniversary celebrations. A former Nothern primary and Fearns pupil. Sensei began training at the RSKC at the age of 9, gaining his 1st Dan black belt at the age of 12 at his first attempt, a feat only achieved by approximately 5% of students. After 5 years hard training he gained his 2nd Dan again at his first attempt and on reaching his 18th birthday became the clubs youngest qualified instructor. Sensei passed his 3rd Dan in 2011 and 4th Dan in April 2015 and became the first RSKC student to achieve this level in its history. 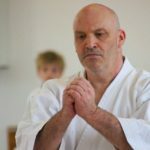 Sensei Stephen Warburton is now the main instructor for the club following Sensei Ian Garside’s relocation to the midlands. Having started training in 1982 in Rochdale Jeff Jones joined the Whitworth club run by Sensei Garside. During the 80’s Jeff found himself working in Oman where he found a KUGB affiliated club so he could continue his karate training. Upon his return to the Britain he began training with the RSKC, gaining his 1st Dan in 2000, 2nd Dan in 2007 and 3rd Dan in 2014. One of sensei Jones’s karate highlights is training and grading with the late great Enoeda sensei who commented on his good spirit. Sensei Jones advises new students to cultivate spirit and to strive for perfection and to never give up. He is along standing KUGB member of 25 years. 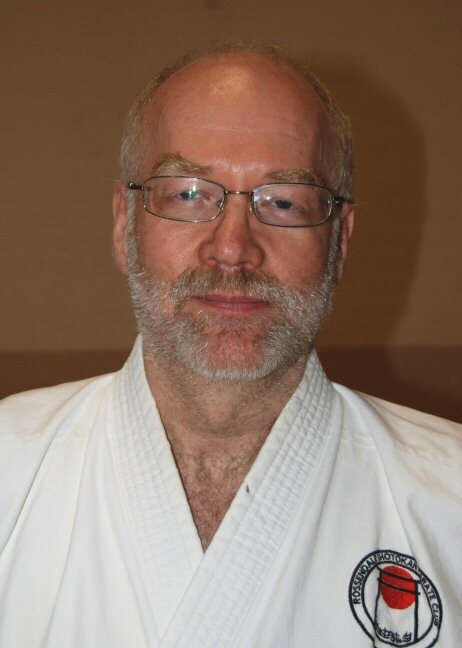 Sensei Rick first studied Karate in the 1980s attaining a senior brown belt grade in the Shukokai style. In 2007, at the age of 45 he joined RSKC and commenced his training in Shotokan Karate under Senseis Garside and Warburton, achieving his first Dan in 2012. He has represented the club in competition and is an active member of the Club Committee having served as both Club Secretary and Chairperson. Sensei Rick’s approach to training is based on the karate maxim –“Spirit first, then technique”, and, as a karateka who returned to the art at an advanced age, he works to inspire a “can do “ confident attitude within the student whereby focus, patience, hard work and determination to master the art will overcome any doubts the student may have about their physical capabilities, and ultimately lead them to success. Sensei Asif Alvi’s start in karate coincided with start of his degree course in 1987 after seeing an impressive karate demonstration during the fresher’s week. At the end of the course it was a double celebration, an engineering degree and 1st Dan Black Belt. All of Sensei’s gradings were by the late Sensei Enoeda. During his college life Sensei was an active member of the club holding the position of club president and captain of the team that took part in many of the competitions. A break in training due to work commitments prevented Sensei from taking further gradings but is currently planning for his 2nd Dan. My introduction to karate was via my then 8 year old son. I used to sit and watch his karate lessons until one day, Sensei Garside asked if I would like to join the training. My response was that at 39 I was too old. However, I gave it a try and have been “trying” ever since. I am now almost 61 but still get great pleasure from the training. Whilst I cannot compete physically with the younger members of the club, I have gained a lot of experience over the years and enjoy passing this knowledge on to the younger members of the club. I gained my instructors certificate in 2011 and I have now passed shodan. I have been member of the committee since 2010 as the club treasurer.